Lesjöfors began life in 1675 as an iron mill, just a few hundred metres from today's modern factory. In 1849 the company began producing wire and wire rope, and 3 years later the first coil spring was designed and manufactured. From the mid 1930s Lesjöfors began expanding rapidly, through both organic growth and acquisitions; and was itself acquired in 1989 by industrial investment group Beijer Alma AB. Since then growth has continued, and today Lesjöfors are positioned as one of the largest and most diverse spring manufacturing groups in the world. 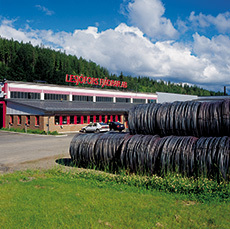 The Lesjöfors factory in Lesjöfors, Sweden.